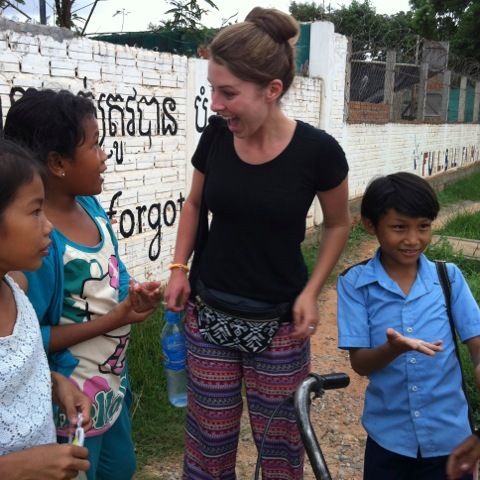 This is a report of my visit to a very poor school in Siem Reap in Cambodia, they have 170 pupils who all want to learn English, but without help from the people who run this school and volunteers and helpers from around the world, would not have a chance. One of the criteria to be a pupil is that their family does not earn over $30 USD per month, the ages are between 7 -14 years old and their families realise that if they do not learn English, they cannot get a job as a Taxi/Tuk Tuk driver, work in Offices/Shops, be a waiter / waitress in Restaurants or eventually go to a form of higher education. This is a legacy from the Khmer Rouge government, led by Pol Pot, they were in power for over 5 years, and were responsible for killing 21% of the population, either by execution, starvation or torture, they exterminated anybody with any form of learning, you could even be shot because you wore glasses, the population of the towns were en-mass sent into the fields, where Pol Pot decreed that the future of the state lay, the towns became Ghost Towns and many hundreds of thousands died of starvation, there are not many "old people" left and the pupils were amazed that Doreen & I were in our 70's and could still be active. My Granddaughter has been to the school three years running, at her own cost, and this time we accompanied her with a donation from the Rotary Club of Slough and a personal donation from Marlena Lewis, last years President. 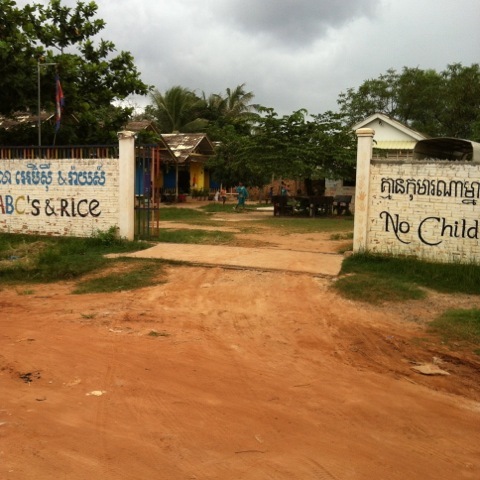 The name ABC's & Rice, was derived from the fact that they learnt English, got a meal and took back to their Families 2 kilos of rice every month, there are 170 pupils at the school, the Club gave £400 (approx $656 USD) which paid for every pupil to have a breakfast for 2 months and every pupil taking home to their families 2 kilos of rice for 2 months. 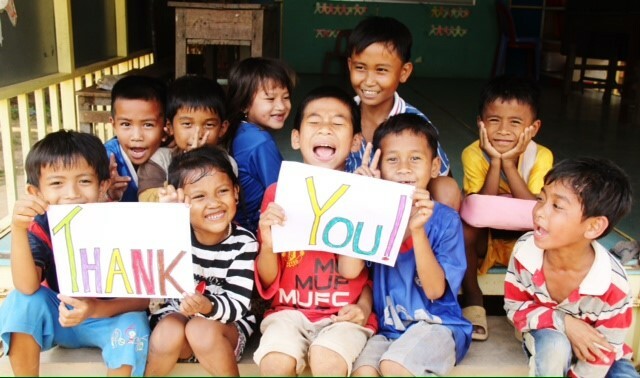 The £100 donated by Marlena provided 170 exercise books, which will last approx 6 months and the balance went to providing Dentistry care for approx 6 pupils for one month. One thing they found when they started the school was that many of the children could not concentrate because of toothache , they did a deal with the local Dentist which has cured toothache for over 70% of the pupils, while we were there one little girl had raging toothache, my Granddaughter took her to the Dentist, approx 6 miles away, and the little girl came back much happier. This is a very potted version of the school and our trip. The good news for Cambodia and the town of Siem Reap, is that tourism is becoming a major industry, bringing with it employment and hope for the future, but you have to speak English. I would love to have taken some of the people from the programme "Benefit Street", made them stay for 6 months, and see what happened to them, they would probably have starved to death, because you have to work to stay alive! 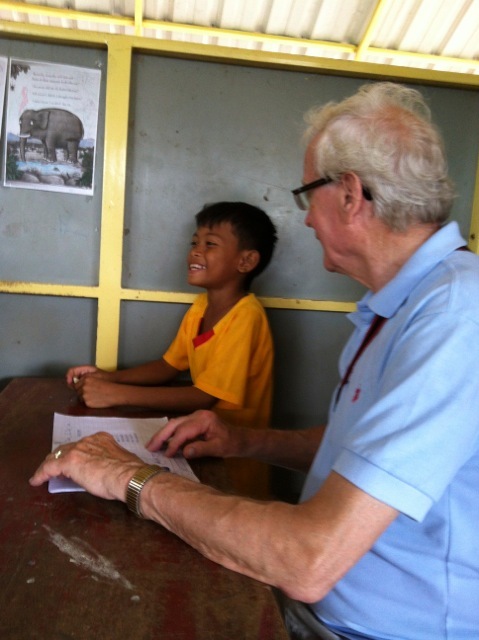 My Granddaughter worked at the school every day and Doreen & I helped to teach every afternoon, it was supposed to be a "two week holiday" but it was the most rewarding holiday we have ever had.